Speed Duel: Arena of Lost Souls is the first Speed Duel Booster Pack in the Yu-Gi-Oh! Trading Card Game (TCG). 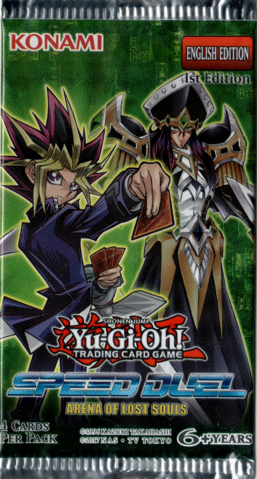 Includes 5 new Skill Cards (1 for Yugi, 1 for Ishizu and 3 for Bonz). Introduces to the Speed Duel format new members and/or support for the "Gravekeeper's" archetype, as well as the Three Musketeers of Face Cards series.